This room is still a work in progress. I need to get some pictures in here. I’m also in the process of making a co-ordinating pennant/bunting to go around her room. Find the pennant tutorial here. The fake roman shades tutorial is from Thrifty Decor Chick. I use those plastic bins for wrapping paper as storage and slide them under her bed…because this room is as small as a postage stamp! They fit perfectly! I recycled a canvas and painted it turquoise, but I have no idea what to do to it. Any ideas? I was thinking…maybe…some word art or text or just letting her paint something??? The small book case is going in the other daughter’s room and I have a tall one that will be painted turquoise or pink…I haven’t decided. I took the inspiration board out of my studio and put it in here for her to hang her art work. I still would like to get a pink shag rug to go by the bed…like this or maybe this one! What are you trying to finish before Turkey Day! I absolutely adore this room! Love it! So simple, fun, and sweet. 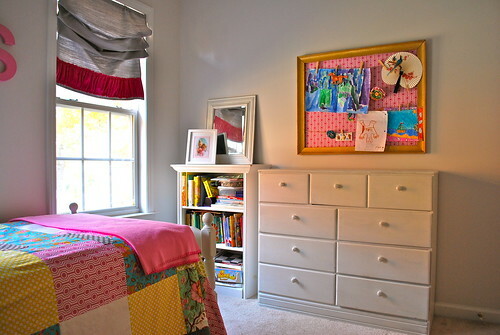 I'm going to try that tute for faux roman shades too….I love the ruffle you added! What a pretty, happy room. 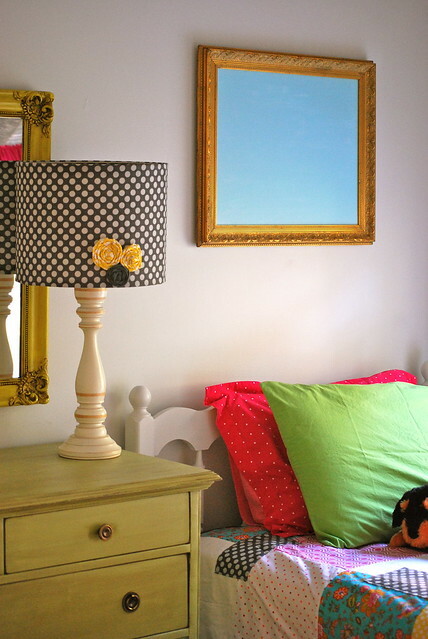 Eclectic vintage with fabulous colors – so much fun for a little girls room! I'm betting she loves it. What an adorable room! Love the mix-matched colors of the furniture. You should get her the first hot pink area rug, it would go perfectly with the style of the room. For the blank canvas, get a list of her favorite animals, places, colors and try to do something that blends it all! For Turkey day I am making 2 casseroles for my in-laws….happy Turkey day to you! i love everything about this room! amazing!! and i think you should let your little one paint something on the aqua canvas. that would be so cute! This room is so darling. I'm loving the patchwork quilt! I love all these girly colors, but my favorite part of your room is the black and white polka dot lampshade with the fabric flowers. Absolutely give your girl some paints (colors chosen by you) and let her attack that canvas. It will be something you'll treasure more each year as she grows older, because we all lose that ability to do true primitive art. The trick is to stop her before the colors get muddied. Good luck. We'll all be waiting to see what she does (no pressure). 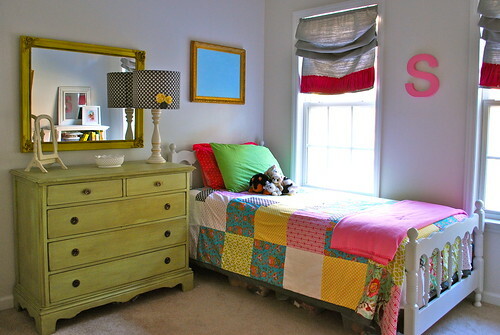 i'm not usually one for bright colors and “mismatchy” style, but i must say this room is adorable! i'd go some sort of text on the turquoise canvas, i'd paint the bookcase turquoise, and i have to say i will be reading over that roman shade tutorial just as soon as i finish telling you how adorable this room is, because i love love love the shades. 🙂 great room for a little gal. soooo fun and yet, sweet. SLIPCOVERS · WINDOW TREATMENTS · PILLOWS · CUSHIONS · BEDDING · AND MORE!